There's no timeouts left, but you still have a chance to make your vote count. 1st round voting ends Sunday at midnight in our March Madness tournament. 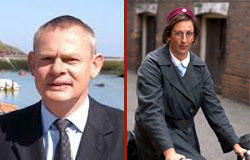 Martin Clunes trails Miranda Hart by 3 votes in their 1st round matchup. Voting ends Sunday at Midnight. You could cast the deciding vote! Several contests have razor thin margins, including a PBS showndown where Miranda Hart (Call the Midwife) now lead Martin Clunes (Doc Martin) by just 3 votes. You can see all the current results below. We're also eagerly anticipating some of the expected 2nd round matchups. Can Giles Snyder's Cinderella story continue against Kai Ryssdal of Marketplace? Will Cookie Monster or Daniel Tiger emerge as the children's favorite? 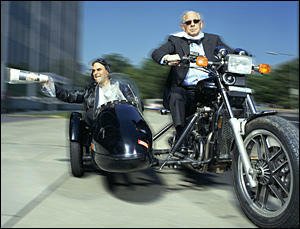 Jim Lange vs Frank Stowers - nuff said. ​You can vote in the form below. If you don't see the form, follow this direct link to the cast your votes.